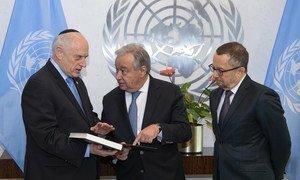 UN Secretary-General Antonio Guterres (right) with Rabbi Arthur Schneier of New York City’s Park East Synagogue, where he attended United Nations International Holocaust Shabbat. 26 January 2019. 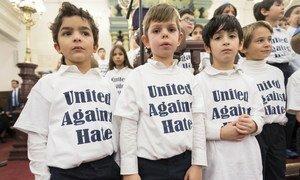 Warning that anti-Semitism, the world’s oldest prejudice, has persisted to torment new generations, Secretary-General António Guterres has pledged that the United Nations will always be at the forefront of the fight against all forms of hatred, and work to strengthen efforts to uphold human dignity for all. “Our urgent challenge today is to heed the lessons of a period when human dignity was cast aside for a racial ideology,” Mr. Guterres said in an address early Saturday morning to the Holocaust Remembrance Ceremony held annually at New York City’s historic Park East Synagogue. He recalled that the last time he addressed the event had been just four days after a man carrying “weapons of war” stormed into a synagogue on Shabbat in Pittsburgh shouting “all Jews must die”. “It was a barbaric assault – the worst anti-Semitic attack in the history of the United States. In our sorrow, we joined hands here in this pulpit,” he said, adding that many faiths had been represented, Jews, Christians, Muslims and others, including the top leadership of the Appeal of Conscience Foundation, all declaring their utter opposition to hatred of any kind. “I am afraid, however, that in the months since Pittsburgh we have had more reasons for profound concern,” lamented Mr. Guterres, noting that last month, headstones in a Jewish cemetery in Strasbourg were defaced with swastikas; this month, rocks were thrown through the windows of the central synagogue in Sofia; and for some time now, anti-Semitic attacks in the United States and Europe have been on the rise. Statistics and polls paint a deeply worrying picture, he said, explaining that anti-Semitic incidents in the United States increased by 57 per cent in 2017. One European poll reported last year that 28 per cent of Jews had experienced some form of harassment for being Jewish. Another revealed the strong persistence of classic anti-Semitic motifs. “The old anti-Semitism is back – and getting worse,” said the UN chief, warning that Nazi symbols and slogans remain widespread, as anti-hate organizations track hundreds of neo-Nazi, pro-Nazi and white supremacist groups. “And as we know all too well, where there is hatred of Jews, hatred of others is also near at hand,” he said, noting that indeed, the world was witnessing a disturbing increase in other forms of bigotry: attacks on Muslims were on the rise; intolerance was spreading at lightning speed across the Internet and social media; and hate groups were using social media to link up with like-minded bigots across borders. “This is the painful backdrop for today’s observance marking the anniversary of the liberation of the Auschwitz-Birkenau death camp. We are together to honour the memory of the six million Jews and millions of others who were systematically murdered. He said the UN’s Holocaust Outreach Programme has activities in dozens of countries. He had also recently asked his Special Adviser on the Prevention of Genocide to devise a global plan of action to deepen the world body’s efforts to counter hate speech. “And it means ensuring that Governments and international organizations show they care about people and are attuned to their needs and aspirations. I include the United Nations in this. And this is a job for all societies, everywhere, Mr. Guterres said. The International Day of Commemoration in Memory of the Victims of the Holocaust is marked annually on 27 January and the theme of the 2019 edition of remembrance and education activities is “Holocaust Remembrance: Demand and Defend Your Human Rights”. Calling for solidarity against anti-Semitism, United Nations Secretary-General António Guterres, addressed an inter-faith tribute held on Wednesday in New York’s historic Park East Synagogue, to honour victims of Saturday’s mass-shooting in Pittsburgh.